1. Remove the seed from the avocado; being careful not to cut into it. Wash away any remaining fruit. Do not rub away the brown protective skin on the seed. 2. With the slightly pointed end up, push four toothpicks into the seed, on a slight downward angle, around the center of the seed. 3. Fill a clear glass with water and allow the toothpicks to hold the seed in place with about 1 inch of the larger end of the seed immersed in the water. Place the glass on a windowsill that gets plenty of sunlight and change the water every few days to prevent harmful bacteria growth. 4. The seed will sprout in two to eight weeks so be patient! The top of the seed will become very dry, and a crack will form emerging a tiny taproot. Make sure the taproot is consistently submerged in water. The taproot will grow longer and a small sprout will push its way out. 5. Once the tree stem grows six to seven inches tall, cut it back about three inches to encourage new growth. Once it reaches six to seven inches tall again, it’s time to plant the tree in an eight- to ten-inch diameter pot with loose, sandy soil, leaving the top half of the seed exposed above the soil. Place the pot in a sunny area. 6. Water the tree regularly. The soil should be moist but never saturated. If the leaves begin to yellow, you may be watering too much. Let the soil dry for a few days before watering again. 7. When the plant reaches 12 inches in height, pinch off the top two sets of leaves. Pruning encourages side shoot and leaf growth. Do this with every six inches of new growth. 8. Repot the tree into a larger pot as it grows. If there are exposed roots at the top or the bottom of the pot or if the plant is wilting, it is time to transplant. 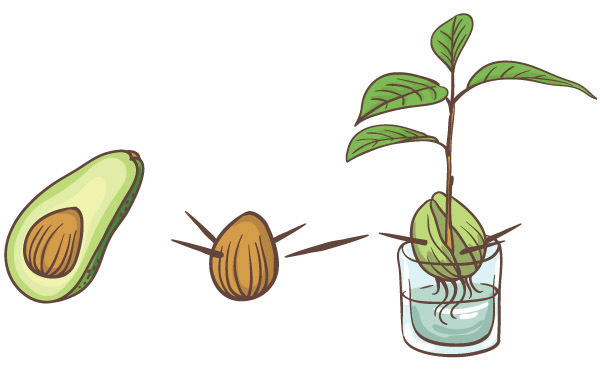 Avocado plants must be brought inside whenever the temperature drops below 45°. For a Little Extra Fun! Use a terra cotta pot and let the kids get creative by decorating it before planting the tree. Apply chalkboard paint to the entire outside and top of the pot, and just inside the rim. Once dry, rub the pot with chalk and then wipe it off with a wet paper towel to prevent the chalk writing from being burned into the surface. Have fun decorating with colored chalk!